To put the Florida Trail's permitting system in context, let's first consider two other great National Scenic Trails. 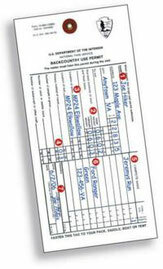 On the Appalachian Trail, permits are only needed when in the two national parks: the Smokies and Shenandoah. Hikers pick up permits at self-serve kiosks at the entrance to the parks. They are free, do not need to be requested in advance, and do not require approval from a park official. The purpose of these backcountry permits is to collect statistical data about how many people are using the trail so that the National Park Service can report this information to lawmakers and secure money necessary to maintain the trails. Out west, the Pacific Crest Trail traverses dozens of different national forests, parks, and other state-owned lands, each controlled by a different management agency and many require permits. Section hikers have to fend for themselves and acquire whatever permits are needed in the section they are hiking, but thru-hikers have it easy. The Pacific Crest Trail Association has worked to make it possible for thru-hikers (and only thru-hikers) to obtain a single permit valid for the entire length of the trail. The situation with the Florida Trail is slightly more complicated, but similar to the PCT. The Trail traverses dozens of different forests, parks, water management district lands, wildlife management areas, a national wildlife refuge, three military bases, and an Indian reservation. Section hikers have to fend for themselves, but thru-hikers have it easier. Thru-hikers are exempt from a number of fees and restrictions—a consequence of FTA lobbying. Occasionally the FT crosses private property and some of these land owners have stipulated that only members of the Florida Trail Association may hike on their property. As a result, membership in the FTA is a legal requirement to hike the entire trail. The FTA website says non-members on these private lands are legally considered trespassers, and yet there is no index of restricted Trail segments! So even section hikers had better play it safe and join the FTA. You can buy a membership online here. These kinds of easements and agreements with private property owners are necessary and in the future will become more likely in order to eliminate road walks and create a contiguous trail. The footpath currently traverses all the public lands it can and private land lies between all the disconnected segments. They must receive the release at least two weeks prior to your hike, but send it sooner because there is a limit to the number of hikers allowed on the reservation each month. The Seminole Tribe will not contact you unless there is a problem. No news is good news. The release is included in the “Long Distance Hiker Packet” provided by the FTA. A copy of the release is also available for download here. Look at the mileage figures in the databook or the Florida Trail Guide by Friend and Keatley and come up with a rough plan for which sites you want to use and when you will arrive. After that, apply online at the South Florida Water Mgmt District website for the free permits. Your estimates don’t have to be exact. The water district gives you a generous window in which the permit is valid. The following chart describes various issues with hiking permissions that you may face along the Trail. Most are restrictions due to hunting or military activity. These are not issues that can or should be dealt with before your hike and can be managed while on the Trail, as long as you have access to a phone. If you carry a cell phone, that makes it all the easier. The official trail no longer goes through Avon Park AFB. However, it is still possible to hike it if you want to follow the old trail. Check to see whether Avon Park Air Force Range is open to hikers at trailside kiosks at both the north and south entrances to the range. Call ahead for the weekly bombing schedule: 941-452-4119. The schedule is posted on Wednesday afternoons and bombing rarely happens on weekends. The lock is kept locked. A day or two before you arrive, call Kim Willis at 561-924-5310 x3333 and let her know when you will reach the lock. She will inform the lock tender of your arrival, who will unlock the lock and let you cross. Thru-hikers are exempt from all fees and may camp at any campsite without a permit except for Lake Jackson. If you want to camp at Lake Jackson, call 352-732-1225. Section hikers must day for day use permits at trailside kiosks. During hunt dates, only thru-hikers are allowed to camp. Only thru-hikers are exempt from all permits and fees and are allowed to camp during hunt dates. thru-hikers do not need a camping permit, but during hunting dates camping is limited. Section hikers need a permit from Swiftmud. Buckman Lock is behind a fence/gate locked with a padlock. If you reach the locked gate between 6:30am - 3pm, there is a buzzer that rings the lock tender. Press it and he will come unlock the gate for you. If arriving after hours, call the FTA office for the combo: (352) 378-8823. Be sure to lock the lock after yourself. $5 per person entrance fee. No other fees for hiking or camping. No camping allowed during hunt dates. There is a $5 fee for primitive camping in the park. Northbound thru-hikers entering park from the south can call the entrance station at (352) 473-4701 when they arrive and pay the next morning on their way out. Southbound hikers can pay on arrival. Check whether Camp Blanding is open to hikers at trailside kiosks at either east or west entrance. If closed for military exercises, use white-blazed alternate roadwalk. All the land between these roads is private timber land. The trail is closed on Foley Timber Co. land during archery, muzzle loading and general gun hunting seasons. or go to the St. Marks National Wildlife Refuge website. The FTA has an agreement with the base to wave all fees for thru-hikers. In the past you were required to carry a letter from the FTA that attested to your thru-hiker status, but no more. All you have to do is sign in and out at trailside kiosks just like at Avon Park.